MD Home Services will replace your roofing. Serving Manistee, Mason, and Oceana counties, MD Home Services is the business to call for all your home improvement needs! Owner Mike Darke has 18 years of construction experience. He started his own construction business, MD Home Services about 9 years ago. Mike and his team can do just about any job, whether it's indoor or outdoor, new construction, or remodeling. MD Home Services also offers winter and Senior discounts, and you can get a free no-obligation job estimate before you commit! Licensed and insured, MD Home Services is ready to start your next home improvement project! Most of us spend the majority of our time indoors when we're home, so it's important to be satisfied with our home's interior spaces. Remodeling or doing some minor cosmetic improvements around the house can drastically improve the value of your home. Not only will you be happier in a fresh, new space, but if you're planning on selling someday, you'll be glad you hired a licensed contractor to make some improvements! MD Home Services is licensed and insured to do interior jobs, whether you need a wall taken down, new cabinets in the kitchen, window replacements, or even a whole new addition! Kitchens--The kitchen is one of the most important rooms in a home. If your kitchen needs an update, MD Home Services can remodel to your needs! Bathrooms--Is your bathroom too small or outdated? Call MD Home Services to update it with beautiful tile and new fixtures. On a budget? MD Home Services can work with you to remodel your bathroom to fit your needs and budget. Living Room or Bedrooms--We do the majority of our "living" in the living room and bedrooms, so these rooms typically see the most traffic, which means it may be time to add a fresh coat of paint, or maybe just a whole new update! Additions & Renovations--From start to finish, MD Home Services can build the addition or accomplish the renovation you've been dreaming of! Expecting an addition to the family? Then it may be time to make an addition to your house! Call MD Home Services for a free no obligation estimate. MD Home Services can build or repair decks and porches. 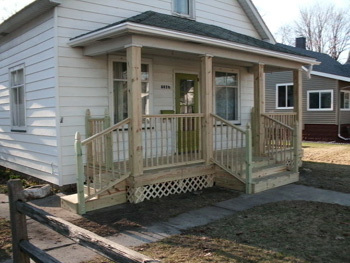 Decks & Porches--If you don't already have a porch or deck, MD Home Services can build one for you! Having an outdoor space where you can entertain, or keep a grill or outdoor seating can be very relaxing after a hard day of work. A large porch or deck will also increase the value of home! Already have a porch or deck, but it needs a facelift? MD Home Services can also paint or stain your outdoor porch or deck, and make any necessary repairs to keep it strong and sturdy. 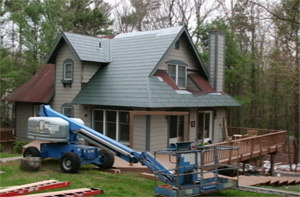 Painting & Staining--MD Home Services can paint your entire house from top to bottom! Keep your home looking sharp with a fresh coat of paint. How about your porch or deck? The sun can fade wood and stain over the years, so it's important to keep a fresh coat of paint or stain on your porch or deck to protect the wood. Out-Building & Garage Construction--MD Home Services can also construct out-buildings such as a garden or tool shed to keep all your outdoor furniture and tools safe from the weather, as well as new garage construction or renovations. Power Washing--Is the outside of your home looking a little dirty or buggy? Call MD Home Services to power wash your home, including deck or porch to clear away all the dirt, leaves, bugs, and debris! Gutter Installation--Is your home lacking gutters, or do you need your existing gutters to be cleaned? MD Home Services can also install gutters and clean them out, to keep the water from seeping in your crawlspace or basement. Roofing--Roofs are a critical element of the home, as they protect our house from extreme weather, leaking, and also extreme temperatures. It's very important to have a quality roof on your home, and MD Home Services can help! They use quality shingles and roofing materials from companies including CertainTeed and IKO Roofing Products. MD Home Services will get the job done right, the first time, so you can rest easy knowing your home is protected!